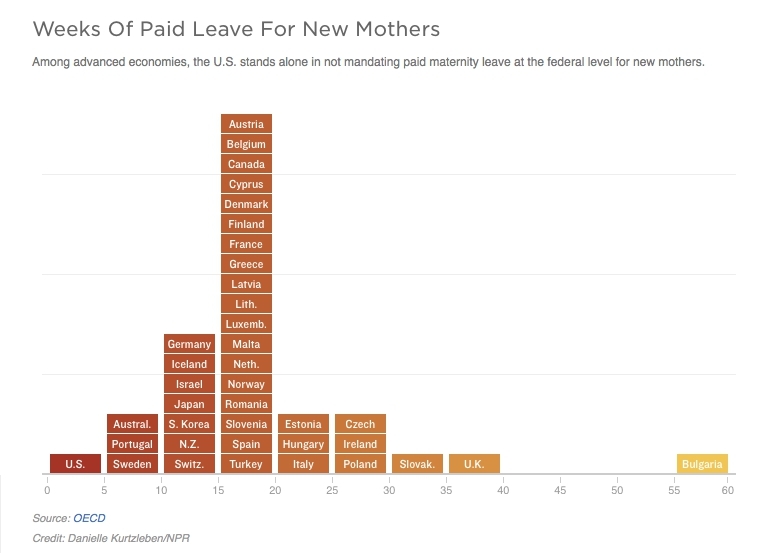 Is the U.S. leading when it comes to maternity leave? This topic is important to address because families are fighting to maintain their homes and feed their children. In America, we should be able to work hard and feel safe, but as a country we are ranking low in comparison to others. NPR released a graph showing the differences in countries and the U.S. ranked the lowest in advanced economies on this issue. There are some strong opinions on maternity leave within politics. With presidential elections right around the corner, we are hearing a lot about women’s issues and how candidates are dealing with them. Maternity leave is ultimately determined by the employer, and the FMLA only requires unpaid leave. Some candidates speaking on this issue are Hilary Clinton, Bernie Sanders, Mark Rubio and Carly Fiorina. Democrats have a general idea that parents deserve to receive a better paid leave system. “Sanders cosponsored Kristen Gillibrand’s FAMILY Act to provide 12 weeks of paid family leave,” says Fast Company. Republicans, on the other hand, tend to look at the struggle from the point of view of the employers. For example, according to CNN, Fiorina says, “I’m not saying I oppose paid maternity leave. What I’m saying is I oppose the federal government mandating paid maternity leave to every company out there.” This does make sense for small business owners that perhaps cannot afford to grant paid maternity leave. However, what about the big companies like Wal-Mart and McDonalds who still have the right not to pay their employees for family leave? Republican candidate Marco Rubio surprisingly supports paid family leave and is embracing the issue as part of his campaign. He proposes to give a 25% tax credit for companies with a cap of $4,000 for 12 weeks per employee. According to The Atlantic, this plan can have an effect on the way employers treat their workers. This issue is a difficult one to tackle, however, it must be dealt with. There are too many Americans working hard and struggling to live successful lives. It is vital that we educate ourselves on policies and plans regarding maternity leave as it affects our economy and community.